As I've no beary news, other than to say I'm making another rabbit (I seem to be in rabbit mode lately!) I thought I would pop some pics of my children (the furry four legged variety) on to my blog. 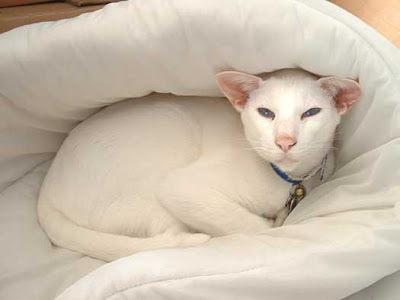 Above is Alfie, out white siamese, who I think is actually a two year old child, masquerading as a cat. Highly intelligent, he knows the word 'no' and 'bedtime' (stomps off to the utility, complaining as he goes) and 'dinner'. Dinner usually makes him go at a much faster pace and he'll stand waiting for the others to arrive before he starts to eat. His manners are impeccable. Below is Harvey. Loves cuddles and is a bit of a drooler when extremely happy. A very soppy, limpet like boy! Then there is Ellie (Above). A rather heavy, chunky, cuddly tabby. Very chatty, though rather monosyllabic. Likes a lap (as do they all) and makes a rather handy hot water bottle, when the evenings get nippy. A rare shot of them all snuggled up together. The chairs now gone and the basket Ellie refuses to go in, either alone or with Harvey and Alfie. If Alfie tries to snuggles up to her, theres a lot of cat cursing from her, till she finds enough is enough and saunters off elsewhere. This last pic is just for the 'Awwww' factor. Harvey is mostly happy to let Alfie snuggle up. Especially if Alf goes about it in slow motion with the odd freeze frame. Occasionally he'll complain, then go about giving Alfie's head a good wash (I think he was a hairdresser in a previous life). Right, now off to cut out the pattern for the rabbit. So hopefully bear/rabbit news soonish. Yes, its my birthday today! Just four hours left of it sadly. Here is my birthday cake! I thought rather than get a birthday cake I should be expected to pick, I'd pick one I actually 'really' liked. Very scrummy too! Alfie our white siamese enjoyed the candle blowing out ritual too, as the candles are ones that relight. I did find them slightly unnerving as they did spark a bit! Well the caterpillar cake is almost gone. Saving the face till last (I love soft fondant icing!). Got Kathy Martins, 'Teddy Bear - A Collectable History of the Teddy Bear', as one of my presents, which I'll enjoy reading. Right, now off to order some birthday food! Above are the bears that will be coming with me to the Totally teddies fair in Loughborough tomorrow! Although I took my time with the bears, everything else has been hectic. Maybe I wanted to get too much done! I have finished and uploaded my brand new website (yesterday). Made two stands for the bears today, which would make a carpenter cringe but they aren't too bad! Very much looking forward to the fair. Its only my second as all the fairs seem to be sooooo far away from us! Loughborough will take us 1 hour 45 mins. Which means me getting up very early. Something I am not good at! Need to take some serious coffee with me! Doors open at 10am. £2.50 entrance fee, £2 concessions, accompanied children 16 and under FREE.